Women in leadership positions should push to make sure that diversity and inclusion is an integral part of their businesses strategy. The correlation with an organisation’s ability to outperform its peers is clear. Women in business shouldn’t underestimate how inclusion can help them connect with existing and new customers – it results in us being better able to give our customers the products and services they need. Secondly, as female business leaders we shouldn’t accept the status quo. We need to ensure all of our colleagues can bring the best of themselves to work, irrespective of gender, creed or colour. This means creating an organisational culture in which everyone can be their true selves, knowing they’re in a safe environment to do so. At NatWest if we're a more inclusive place to work, great people will want to work with us and more customers will want to bank with us – so it's a business imperative. To help achieve this, at RBS we have implemented unconscious bias training and have reached the milestone of having more than 80% of our colleagues go through this training. Today female business leaders need to be bold and be public in their aspirations for their business. That’s why in 2013 we set an aspiration to have 30% senior women in our top 5,000 roles by 2020. We chose 30% because it marks the tipping point where female contributions influence teams enough to change behaviour and culture, according to McKinsey research. We should have formal mentors and structures in place. This means taking real action to support women through development, networking and performance support. Our Women’s network is vast, very active and very vocal. It’s a great asset to the organisation. Organisations should also not be afraid to learn from their competitors and those working in other sectors. 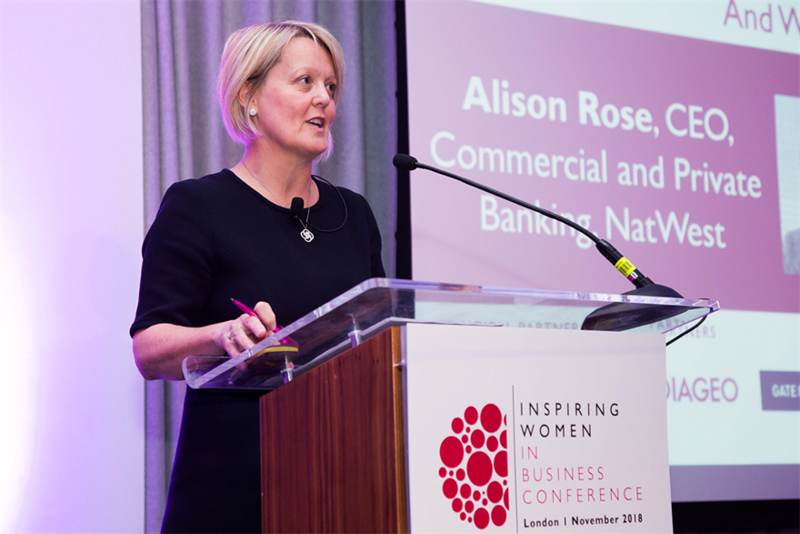 I was delighted to have the opportunity to give the keynote address at Management Today’s Inspiring Women in Business conference earlier this month. It was great to hear from other speakers who are blazing a trail in their own respective fields whilst also promoting issues which are close to my heart and of utmost importance to me and my organisation. I left the conference enthused, knowing that there are more opportunities for women to progress within organisations across the UK. I look forward to more conferences like this.